Your order may be delayed if you do not provide this. A smartly designed sports tank lid with Civic logo ensures that your Civic Type-R will get ample attention, even while you are tanking up. Are the parts we sell Genuine Honda Parts? We are an authorised Honda Dealer situated in the North West of England and only sell Genuine Honda Parts & Accessories. We also sell some other products e.
Autoglym, LUK, NextBase however these products are clearly marked to avoid any confusion. What do I do if my product breaks down during the guarantee period? In the unlikely event that an issue has not be resolved to your satisfaction, please let us know by contacting our Customer Service team any time during our opening hours. When will my order be dispatched? We will try and dispatch all orders within 24 hours subject to stock, however many items will be sent the same day. What if my order hasn't arrived? If your order has been dispatched and has not arrived within the expected time period, please let us know by contacting our Customer Service team any time during our opening hours. What if my order arrives damaged? Please contact our Customer Service team any time during our opening hours. What if I'm not in when you deliver? Why should I only fit Genuine Honda Parts to my vehicle? We don't use just any old replacement parts for your Honda. Are all air filters made equal? Every cog, just another cog? Who can tell the difference anyway? A Honda engineer knows the difference. And that makes a difference to the performance of your Honda. Which is why we spend a great deal of time specifying and making replacement parts for your car. No matter how large, small or tiny. Genuine Honda Parts Are Safer. Is the number of competitor discs that don't meet Honda's stringent standards. Every Honda Brake Disc is engineered for each Honda model. We carefully monitor all the metals in each disc. Change the metal by using a competitor disc, and this can affect the ABS system and increase the stopping distance. Is the amount of emissions that pass into the catalyst - and not into the inside of your car or the environment. We know the difference just 1% can make to you, so we test each Honda Exhaust to a zero tolerance level in a hermetically sealed chamber. Genuine Honda Parts Are More Durable. We test our Honda Oil Filters above the rev limit for 100 hours solid. This ensures they can withstand extreme temperatures and vibrations. They are made with 60% more filter inside than regular oil filters, so your engine is fully protected between services. This is how much longer a Honda Charcoal Pollen Filter lasted, compared to a competitor filter, when tested under extreme conditions. The average life expectancy of a Honda Stainless Steel Exhaust. You aren't expected to know the difference, but it's why we started our own exhaust company. This is how long our heat test' for the Honda Timing Belt lasts. First, we heat a belt to 125 degrees for 70 hours. Then we boil it in oil for another 70 hours and finally, it is driven the equivalent of twice around the world. This means you can be confident that your Honda will not let you down when Genuine Parts are fitted. Genuine Honda Parts Increase Performance. Honda Air & Pollen Filters capture 99.9% of impurities in the air. This is four times more than some other filters. These, when tested, only filtered 75% of particles. Honda filters are also designed to last 10 times longer than some non-Honda parts. Where's the best place to test our cars? To push them to the limits of their endurance? We thought a race track would be good. So we built two: Suzuka and Motegi. Six consecutive F1 constructors championships. And parts for your Honda that perform at the highest level. Only Honda Genuine Parts ensure that your Honda runs as it was engineered to. The next time you have a service, keep your Honda, a Honda. It is very likely there will be a surcharge if your postcode falls within one of the following IV, HS, KA27-28, KW, PA20-49, PA60-78, PH17-26, PH30-44, ZE. NORTHERN IRELAND is subject to a surcharge due to the ferry charge. Timings will, however, depend on the speed with which your credit/debit card company process the credit. At Genuine Honda Parts, we are committed to providing our customers with the best Honda products, service and support. Our staff are always available to assist with your needs and we are committed to your satisfaction. 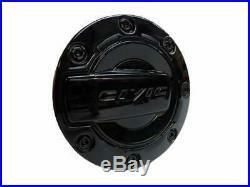 The item "Genuine Honda Civic Type-R Aluminium Sports Fuel Tank Lid (Crystal Black) 200" is in sale since Friday, February 16, 2018. This item is in the category "Vehicle Parts & Accessories\Car Parts\Exterior & Body Parts\Fuel Caps & Covers". The seller is "coxmotorparts" and is located in Morecambe. This item can be shipped to North, South, or Latin America, European Union member countries, Australia.